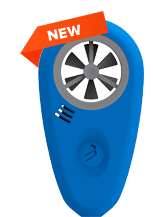 WeatherFlow WIND and WEATHERmeters are miniature weather stations you use with your smartphone to collect real-time wind, temperature, humidity and pressure readings. Readings are recorded and displayed directly in the Wind Meter app. The free app is available on App Store and Google Play. Copyright © 2019 WeatherFlow. All rights reserved.